My mother was evacuated to somewhere in or near Dumfries. Jean Clark was born in 1926 so she would be about 13 years of age. She talked of the house having a window for every day of the year. It must have been some size of house with 365 windows !!!! I would love to see this house if it is still standing. Jean Clark lived at 35 Cowcaddens Street. After the war, she married my father Thomas McLaren from Dennistoun.They lived in Sandbank Street, Maryhill and later moved to Croftfoot.Does anybody remember them or recognise the Dumfries house ? Any help would be appreciated. From researching your question a bit on the web, I would guess that the house your mother refered to was Maxwelton House (home of Annie Laurie of the famous song). 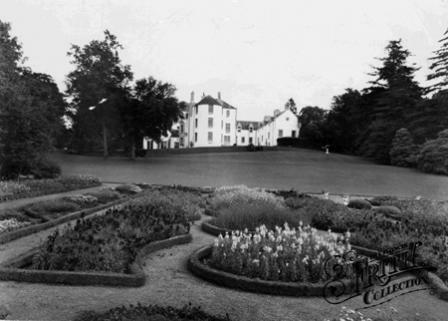 The 'castle house' is located in Moniaive, which is 15 miles north west of Dumfries. I found quite a few accounts of Glasgow children being evacuated to the Moniaive and also nearby Auldgirth. Maxwelton House is known locally as 'the house with 365 windows'. However, it is unlikely that your mother stayed there as it was allocated to the Norwegian army in exile during the war, who used the site for training a special unit of soldiers. It may be that your mother lived nearby? There is another possibility, especially if your mother was unaccompanied by her parents, that your mother was evacuated to Cally House, a wartime residential evacuation school established by the Glasgow Education Authority in Gatehouse-of-Fleet, 30 miles south west of Dumfries. I wondered if you had received any more information about the house near Dumfries your mother was evacuated to. I was informed by a descendant of Sir Wilfred E. Laurie that my grandmother stayed behind at Maxwelton House to cook for Glasgow evacuees when the Laurie family moved to a smaller house during the war. I hope this is of some help. Please feel free to contact me. I would love to know more about the evacuees and their memories of that time, if they did indeed stay in Maxwelton House. Hello Shiela, I hope I can help you in your quest for that elusive house in Dumfries. I was born in 1939 and lived at 125 Coventry Drive. Dennistoun Glasgow E.1. My brother Jim McIvor, born in 1936 was evacuated along with others in the district to Broomrig House in Dumfries ( I am still trying to trace this house myself) I was later transferred from a nursery in Mid Calder to join my brother and my mother and my mother ISA who was a cook there. The house was very large and situated on the banks of the River Nith. There was an aerodrome on the other side of the River and arailway station close bye. I remember seeing troop trains passing under a bridge. The soldiers threw out gum and chocolate to us. I remember that school classes were held there ( I sat at the back too young to participate. The headmaster was Mr. Teasedale. Hope this helps. I can be contacted at 01355 904342.